Vacation rental house. Sleeps 12, 5 bedrooms, 4.5 bathrooms. No pets allowed. 1) Beach Bound VW95 provides 3 paved parking spaces, 2 in the driveway and one in the garage, for 3 medium sized vehicles. If you rent a golf cart there is a place for it to be parked. 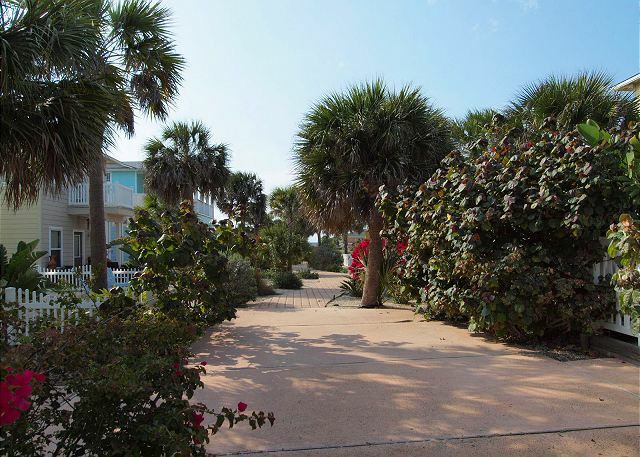 Beach Bound VW95 provides ample parking for 12 guests, properly planning the correct number of vehicles prior to your departure will enhance your vacation experience. Great time with family. VW95 was great. Only negative was we needed a dust pan when sweeping. Comforting to be in a nice home while my island home under repair from hurricane damage. This is the 15th year in Port A, second in VW95. Our family loves the special memories we make every year. VW 95 is the perfect place for us. The adults have king size beds and the kids have places to spregad out. The gated community helps us feel at ease with the kids riding their scooters around. The pool is a relaxing place to "chill" after a day at the beach. We enjoy sitting around the bar preparing meals and the balcony is a welcome oasis. We are already making plans for next year! The cottage was very large and comfortable. The kitchen was well outfitted. The gathering area furniture left a lot to be desired. The sectional was uncomfortable and you felt like you were all lined up. The cottage was convenient to many activities. Not the beach. The pool was great. The maintenance men were the best. Each time they came out they were friendly, professional, competent , and patient. They are to be commended. We had a great stay and will be back again. We had a great stay at Beach Bound. Our extended family was here for a week of our month's stay. The house was large enough to give all 11 our own space. The large dining area was well suited to our large group as was the counter seating for my husband and I when we were alone. A great home! We brought our family for a fun relaxing time at Port A and it was a success! Lots of time spent at the beach, pool at the house, dinner at Virginia's and a Pirate's cruise. The beach house was more than we dreamed. It was large enough to spread out and easily come together in the common areas . We have been coming to Port A for about 12 years and this was the best rental ever. 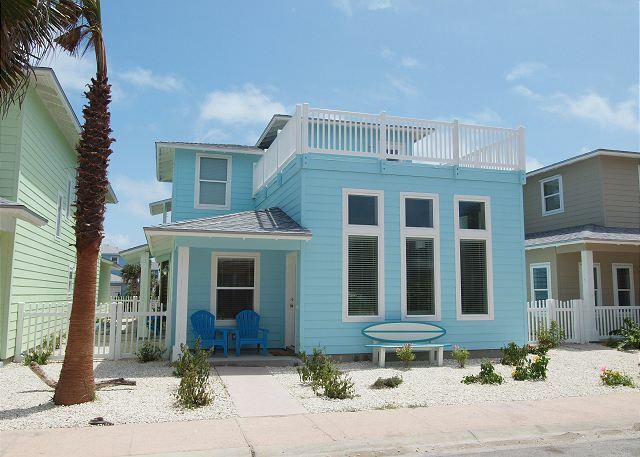 Beach Bound is a beautiful house as pictured in the photos. We were pleased with the spacious kitchen, dining and living area. The sleeping spaces were comfortable and served our group well. We will definitely rent this property again! We had an awesome time. The house had plenty of room for 5 children and 8 adults with beds left over. The kitchen was fully stocked. We had a fabulous week-end at VW95. We took our family of 13 to enjoy a vacation and birthday party. Everyone had plenty of room to move around with space to spare. The description was true to pictures and customer service was excellent. This is the second time we have stayed at Village Walk, yes I would recommend this location. We had the birthday luncheon at Fin's and they were very accommodating to a large party and the food & service was EXCELLENT!!! Very pleased with the house. We had family members ranging from 3yrs old to 96, a couple of safety issues would have been helpful, I.e. Grab bars in master downstairs bathroom, rugs that would not buckle. Soap for washing machine would have been nice since we had limited towels, no dish washing soap or trash liners. Several light bulbs needed to be replaced, remote controls were challenging and no guide to help. As always with PAE great time great people. Love the property and the vacation was great. We had a weekend getaway with a group of friends and this house could not have been more perfect. The kitchen was fully stocked (tons of utensils, pots, serving trays, bowls, appliances, etc..). We even brought a crock pot and blender not knowing that they had several blenders and a large crock pot. I think we found that the only thing it didn't have was a pizza cutter! The A/C worked very well although it did take a few hours to cool down once we got there but once we were back from the pool it was nice and cool and stayed that way until we left. The house layout was really great, long and skinny with the living area in the front and all beds towards the backside of the house. The beds were very comfortable and everyone was satisfied with their stay. Just to note that the room with the two twin beds is actually an open room (no doors) and the blue king room and bunk room adjacent to it has doors. We originally had some girls slated to stay in the twin bed but due to the openness of the room they switched, which was not a problem. The only thing that was kind of a bummer was that the neighborhood does not have it's own beach access (which we knew before booking). This is really OK for Port Aransas since you have to lug everything to the beach in a car anyways but it would have been nice to be able to walk back and forth for lunch. Overall it was a great stay and we had no issues with Port Aransas Escapes or the house! The condo is precious! It is large, modern, bright and open. The kitchen is so well stocked with dishes and glassware and serving items that you can entertain a large group. The kitchen, bathrooms and bedrooms were clean. The floors on the lower level may have been swept, but they were not mopped well. That was my only complaint. Our kids and grandkids from Alaska decided to spend Christmas with us again this year. We wanted to make it special because our oldest granddaughter is graduating from high school in May. There were six adults and six kids - 5 being teenagers. The house worked out perfectly!!! There was seating for twelve at the table. There were enough bathrooms for all four girls. And the best part - old grandma and grandpa were able to stay on the first floor without having to climb stairs!! The main living area was on the first floor. Close to the beach. Safe neighborhood. Clean and well equipped house. Excellent accommodations!!! And adequate parking for our four cars. We had a great time! It would have been even better if the fridge's ice maker and water line was working. We are glad to hear you had a great time. We apologize for the fridge issues and we will be sure to get with our maintenance department about this. 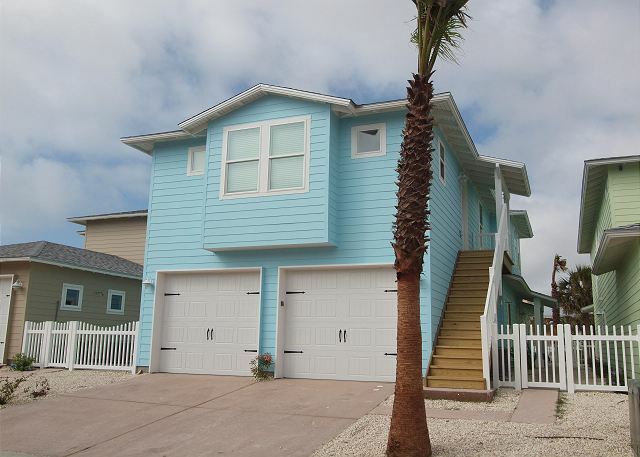 Just give us a call when you are ready to come back to Port Aransas. The house was great nice kitchen and bedrooms! There were however roaches we kept killing. Loved the house. It was perfect for our family vacation. Noticed water leaks on the floor when we entered; however, workers came in and took care of it right away. The house was cute and clean. We would definitely return. We enjoyed renting from Port A Escapes. Staff was friendly, house was clean and nice. The only problem, was that the beach was not within walking distance, as we thought we had been told. 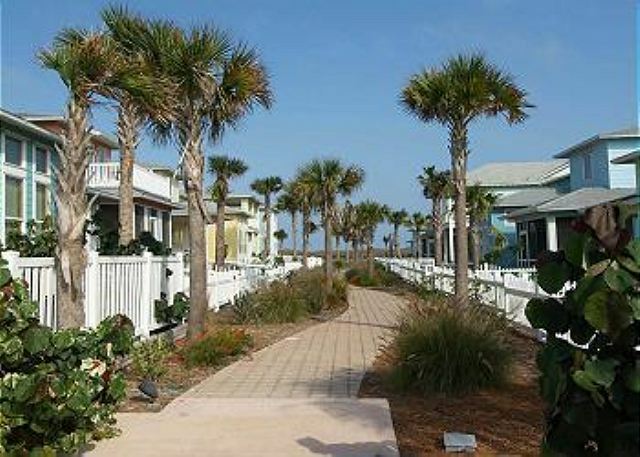 We had a wonderful time and Beach Bound was perfect for the 12 adults who stayed there! Plenty of space, great balcony, location, etc. Would definitely recommend and would stay there again! This rental was perfect for a weekend getaway for our extended family. Grandparents stayed downstairs with two families sharing 4 bedrooms upstairs. Although the descriptor lists this unit as a 5 bedroom, there are actually 6 bedrooms if you count the twin beds in the open area upstairs. Lots of room....beautifully decorated....great kitchen, living and dining area...we had a wonderful time. The House was really nice, all the appliances were clean, the bedrooms were very nice with bright colors. VERY CLEAN!!! We enjoyed the open living space and large table for all our friends. This is the 6th Thanksgiving our family has stayed in Port A. This home was by far the best appointed kitchen we have had. Usually I bring my own pans and knives, but I didn't have to with this home. The adults and children thoroughly enjoyed our stay. We rented for the month and the few issues we had were quickly handled by management. Overall, we had a wonderful time. It was beautifully decorated and had the perfect space for our large family of 14. However, we did have some issues with the new appliances but they were noted during our stay so hopefully the next guests will not experience the same thing. This is a great house for a large family! Kitchen is awesome with enough dishes and supplies to cook anything for everybody!We loved it. We never did get wifi to connect on our devices on first floor. Office staff were very nice however answering service not so much. When we called in the evening to confirm wifi code they told us to go to a coffee shop. Only other suggestion we have is maybe not turn air up to 80. It was so hot outside when we were there that it took 6 ours when we first arrived to get house to comfortable temperature. We have a very large family and the house was gorgeous, it accommodated all the children and adults. We felt right at home! There was more than enough of everything. It wasn't right on the beach but with a lot of kids you have to take a car anyway. We will definitely be using these guys again and again! We were so sad to leave! My entire family goes to Port A every summer for vacation for a week. We had a wonderful time and the home is lovely and roomy but we did have a couple of disapointing issues. We did see several roaches the upstairs bed was broken so we had to find some other sleeping arrangements. One of the toilets broke on the last day of our stay. I would stay in this home agian we did have plenty of room but would like to have been notified of the bed situation. My family and I had fun. The convenience store was very convenient. Of course the internet was a little low down but although that was down we managed to spend more quality time with family. It was very nice and me on the rooms were very colorful. The people are very nice and very helpful I really did appreciate that, I would totally recommend this place. We had an amazing stay here! A few couples with children fit perfectly with everyone having their own space while plenty of room in communal areas like the living room and kitchen. The only slight downside was when taking out our trash we had to walk to a dumpster but it's not far at all. The view isn't great but we didn't plan on doing much scenic viewing anyway. 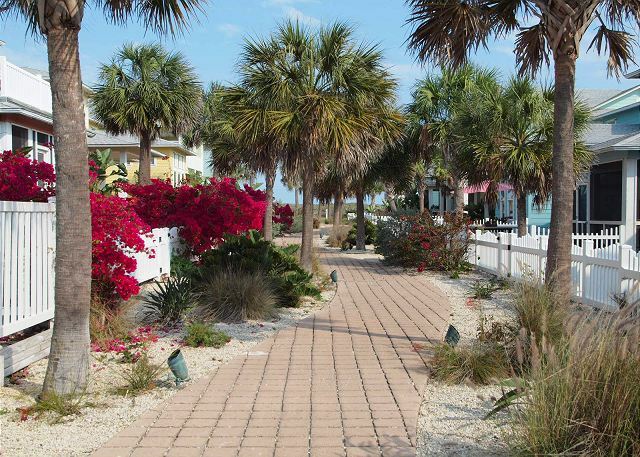 The beach is very close and the house even has an outdoor shower nozzle to rinse sand off! Perfect for the kids. The pool is right behind this particular condo which was a nice perk too. The kitchen has all the utensils, appliances and cooking gear you could need! We loved it and are coming back next year for sure! Village Walk #95 is an awesome vacation house! We thoroughly enjoyed our stay! It is perfect for a large group - everything you need (and more)for cooking and dining in, wonderfully decorated for the beach environment, very roomy and comfortable family room and dining furniture, love the dining table that seats 12! It was great to all sit down at the same table for meals - plenty of very comfortable beds for sleeping. 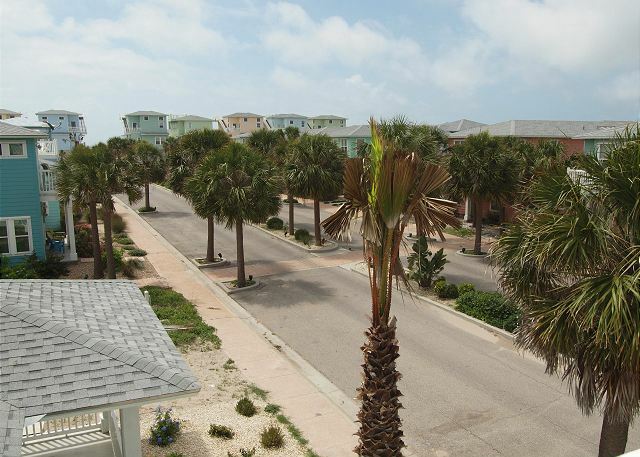 The only downsides are no boardwalk to the beach and no view of the water, but the wonderful accommodations help to turn those things into minor inconveniences. We had a wonderful time at this location. There are a few things to finish from construction but it was a very nice house. We will definitely stay in the Village Walk again. The house layout, decor and roominess was 6 stars. Construction was just completed so there a few very minor messes (which was understandable and very minor). It was a little difficult to connect to the internet, which was fine because we did not want to spend much time on computers or other electronic devices. Highly recommend the house, it was more than perfect. It got amazing reviews from several families (even a couple families staying at another location).